Indie Retro News: Maldita Castilla EX - Locomalito's Ghouls 'n Ghosts inspiration announced for Xbox One! Maldita Castilla EX - Locomalito's Ghouls 'n Ghosts inspiration announced for Xbox One! We don't usually feature console exclusives, but this news was just so good we just had to shout about it, as the bloody brilliant retro inspired Ghouls n' Ghosts game ' Maldita Castle ' is coming to the Xbox One as ' Maldita Castilla EX '. Published by Abylight Studios and developed by none other than Locomalito, the same designer behind the epic Shoot 'em up of Hydorah, and the ZX Spectrum look alike Platformer of l'Abbaye des Morts. Has announced the enhanced version of the original game, with brand new game stages, new final bosses and enemies, new illustrated bestiary's with unlockable information about the legends featured in the game, 15 new unlockable achievements and new songs for the original soundtrack and the remastered audio. To coincide with this news, a new trailer has been released! 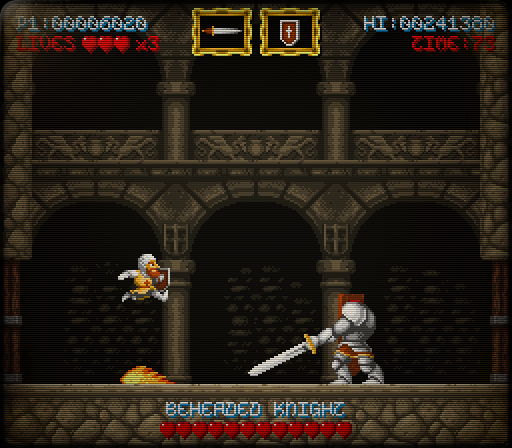 Maldita Castilla was originally published back in 2012 for Windows, Ubuntu, Ouya and Mac. This lineal action-arcade gathered unanimous recognition both from gamers and critics, not only for its addictive gameplay but for being a double tribute also: on the one hand, to classic arcades from the 80s such as Tiger Road, Shinobi or Ghosts'n'Goblins; on the other hand, to Spanish and European medieval history and legends.